The first time an HPSDR is upgraded, the JTAG programming firmware is loaded into the Ozy board. This only needs to be done once. After this, Ozy is put in the 2nd slot from the power connector, and the Mercury and Penelope boards are upgraded one after the other in the slot between the power connector and Ozy. Finally, the Mercury programming batch file expects a .cdf file for the Mercury EU board, and this can be easily created by modifying the TAPR Mercury .cdf file in a text editor to contain the file name for the Mercury EU firmware. These files should be updated in due course on the svn, eliminating the need for modifications. 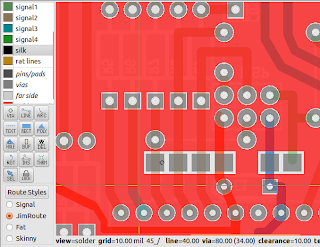 While designing with the OSS gEDA toolsuite for pcb design, I found myself with a pcb with an AVR micro destined to have an Arduino serial bootloader installed. 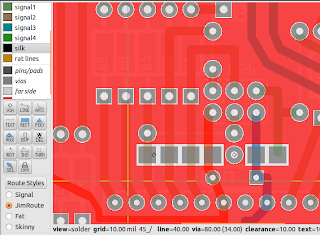 I needed to figure out a simple way to create a row of six pogo pin pads on the PCB to allow in circuit programming. 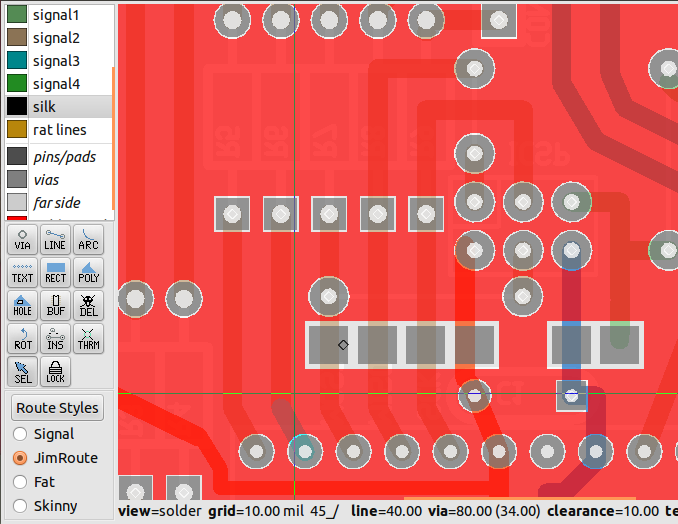 The difficulty arises when trying to create what is effectively a row of pads without a solder mask in gEDA. Normally, the only way to have a soldermask clearance around a pin or pad is for it to be an element itself, or part of an element. Despite multiple attempts, based on mailing list hints found with google, I could not turn a polygon or track into an element via the "select", "cut to buffer", "convert buffer to element" process one can use for a via. The solution was to create a footprint comprising a row of six pads, in which the clearances could be easily specified. and then saved as "PogoPads.pcb"
Then, in PCB, one can use "File" -> "Load element data to paste buffer"
In this case I have made the 6 pogo pin footprint seven pads in length, to keep the +5V centred on the row of pads, in an effort to avoid possibly expensive reverse polarity mistakes in the event of a hand held pogo pin programming tool being used the wrong way round. I then added a via in the gap between the 4th and 5th pogo pads to act as an alignment aid for the pogo pin tool/jig, in case I find that it is required or useful. 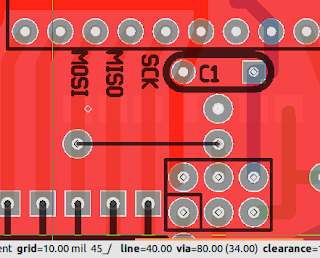 The keen eyed will see the nearby, six pin, in circuit programming header which will be the alternative means of programming the board, and the row of pins for the AVR and decoupling cap just below the newly placed pogo pin pads. The pogo pads are just visible on the bottom side. For those wondering what pogo pins are, they are spring loaded pins held in a jig that can be pressed against pads on a target PCB, allowing testing or in circuit programming to be done without a bulky or expensive programming header being needed. This technique should also work for transmission lines. UPDATE: here are some pictures of the final result. The PCBs were done by Mitch, at Hackvana. You can compare the final product with the gEDA screenshots above. Note also that by doing lands this way gEDA will generate a solder stencil containing the lands. You can ditch the solder stencil gerber if you do not need a solder stencil. 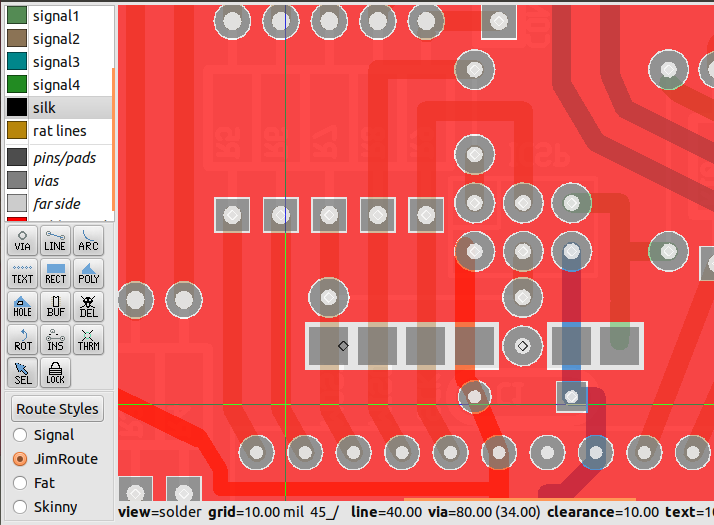 Alternatively, generate your required solder stencil gerber file before adding the lands.